The Evening Pizza Cruise departs at 18.30 from mid-March to the end of October and at 18.00 during the winter months. Evening is the best time of day to cruise the canals, you will have the chance to see the city transform as daylight fades and historic buildings are illuminated. We are comparing Amsterdam Pizza Cruise Tour Prices from leading ticket suppliers and Try to find you Cheap tickets prices on the market. After leaving the mooring your riverboat will float through the canals and the Historical centre, so get ready to enjoy panoramic city views for the next 90-minutes. Meanwhile, your onboard guide will provide the narration. On the way to Grachengordel, Amsterdam's 17th-century neighbourhood, you will be served a pizza and drink of your choice. A range yummy options are available, including something for all the vegetarians onboard. Eat up and finish your meal with something sweet. And there's no need to worry about extra costs because you'll have unlimited drinks while onboard. This cruise is the ideal way for families (with pizza-loving children) or friends to see some of Amsterdam's most famous landmarks from the deck of a floating pizza restaurant. Children can choose from a range of soft drinks to accompany their pizza whilst mum and dad can sip a cool beer or a glass of the house wine. 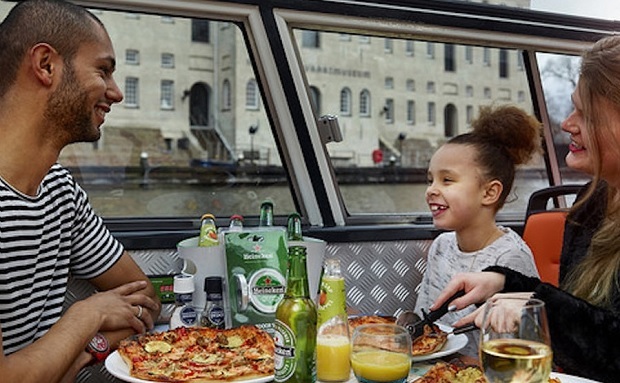 The evening pizza cruise is aimed at people looking for a sociable sightseeing tour. This is an opportunity for families and friends to come together to share food as well as a unique experience. This will also appeal to visitors who prefer to have a live guide than an audio guide. Your Experience With Amsterdam Pizza Cruise Tour? Spend 90 minutes of your evening exploring Amsterdam's glittering canals. Soak in the city's unique architecture and intriguing facades. Pass by historic buildings and bridges and let your expert English speaking guide teach you about significant landmarks and times in Amsterdam's history. Hear about the Italian influence on this famous Dutch city whilst enjoy a delicious and freshly made Pizza. Relax with your friends, children or partner whilst cruising on Amsterdam's waterways. What Amsterdam Pizza Cruise Tour Includes? 90 minutes cruising through the Amsterdam's canals. An English and Dutch speaking local guide. Choice of one of our tasty Pizza's, followed by a complimentary dessert. Unlimited drinks (Including soft drinks, sodas, local wines and beers). A full-sized pizza is included for each passenger so you should avoid eating for a few hours before joining the evening cruise. Travelers Reviews about Amsterdam Pizza Cruise Tour? The evening pizza cruise has a 4.5-star rating on Viator, TripAdvisor and Get Your Guide. Travellers have said that the cruise was the highlight of their stay in Amsterdam and that they would highly recommend the experience. Some reviews point out that the boat can be quite busy and said that they had slow table service. Tickets are accepted either printed or as an electronic voucher. Refunds may be made up to 24 hours before date of tour, some tickets are non-refundable. The Cruise will last approximately 1.5 hours. There is wi/fi available at some of the moorings. Winter evenings on the canals can be chilly so remember to bring an extra jacket. Departure Point: Stromma Damrak Pier 5, or Prins Hendrikkade 25, 1012 TM.